At AC4 Fitness we recognize that a critical aspect of staying with your exercise program is convenience. We maximize convenience by providing each one of our members with their own Key—providing 24-hour access to both locations. Now you have even fewer excuses! We employ state-of-the-art security cameras and emergency notification systems for member safety and comfort during Non-Business Hours. After the age of 35 we all start to lose muscle. Strength training is the most effective means we have of preserving muscle, which can reduce the symptoms of osteoporosis, diabetes, back pain, osteoarthritis and depression, while reducing body fat. Results can be miraculous. AC4 Fitness provides a wide range of equipment with exceptional fit and feel for the first-time user or seasoned athlete. For safety, we do not offer Olympic Bar exercises. The benefits of regular cardio exercise cannot be overstated: reduction in body fat, reduced resting heart rate, reduction in blood pressure, a 50% reduction in heart disease, reduced risk of type 2 diabetes and even some cancers, not to mention reduced anxiety and stress. Your doctor will thank you and so will your loved ones! So, watch TV or stream your favorite music while you get your heart rate up and burn some calories on a wide variety of cardio equipment including: treadmills, elliptical trainers, upright and recumbent bikes, stair-climbers, and more. The number one reason people drop out of their exercise program is a lack of time. But, as experts we know that exercise does not need to take a lot of time when the time is well spent. Keeping exercise simple and easy eliminates that concern. Just three days per week and 30-minutes per workout is all it takes. And with FREE instruction, you’ll be empowered to achieve your goals at your own pace and on you own schedule. Massage is a great way to reduce muscle soreness, stiffness, and tension, as well as enhance overall wellness. But for many, massage can be expensive and then there’s the need to “disrobe.” Hydro Massage beds provide the benefits of massage without the downsides. Enjoy powerful waves of heated water that span the full length of your body providing a therapeutic, deeply relaxing and rejuvenating massage. VIP members can enjoy 10 minutes a day of total relaxation while remaining comfortable and fully clothed, with a bit more money in your pocket. For individuals seeking to tan, moderate indoor tanning is considered a smart alternative to tanning outdoors. 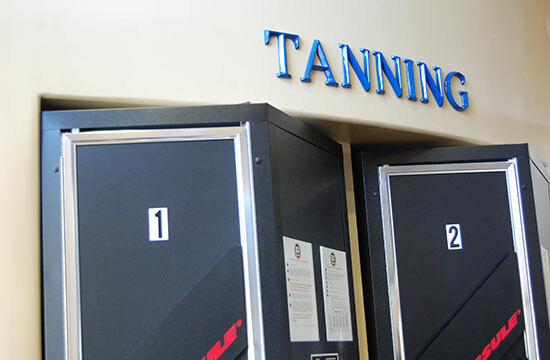 Our Tanning “Booths” offer a convenient, controlled and safer alternative to outdoor sun exposure. Tanning Booths are also more sanitary and efficient than the typical tanning bed. This means faster tanning (never more than ten minutes). You may view AC4 Fitness as an indoor tanning salon with a free gym attached, or a health club with a free tanning salon. Either way, it’s just one more compelling reason to join AC4 Fitness! Studies show that having the support of friends and family increase your chance for long term success by 90%. What better way to have their support than to have them as your workout partner! Guest visits are available during Business Hours. VIP members receive a special discount on Guest Visit fees with no limit on the number of visits. So, BYOB (bring your own buddy)! Functional training exercises are a great way to recover movement that has been impaired by an injury. It has also become a great way to target muscle groups and develop balance needed for specific sports, or just daily activities in life. Our Functional Training area features two Functional Training System machines that offer resistance training with freedom of motion to increase core strength, balance, stability and coordination. You will also find kettle bells, plyometric balls, light dumbbells, BOSU balls, and more. We consider Stretching to be the third discipline of a comprehensive exercise regime and firm Abs the foundation of a strong core. Either way, they’re important enough that AC4 Fitness has provided a specified area for this important floor work. You no longer need be trampled underfoot, but instead enjoy your own little corner of the gym! 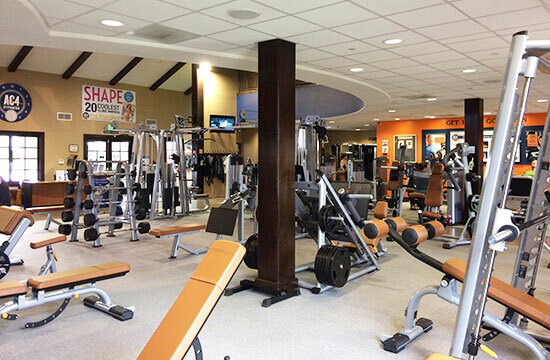 AC4 Fitness provides Wi-Fi for the convenience of members who desire internet access while working out. You might find it beneficial to stream music while weight training or videos during your cardio conditioning--or even while relaxing on a Hydro Massage bed. The AC4 Wi-Fi is a closed and private system that provides the member with greater security and higher performance. Gone are the days of a couple of TV’s hung on a wall to serve a dozen other exercisers. By giving you your own personal TV, the time will pass quickly. You’ll look forward to your workout and be back for more—getting you better, faster results. Personal TV’s are available on virtually every piece of cardio equipment. Just bring your own ear buds, choose your cardio workout, plug in, tune out, and get in the zone. Reducing the hurdles to joining a health club is a top priority for AC4 Fitness. One way we help to achieve this objective is by providing a comfortable, less threatening environment. You’ll find only private shower rooms at AC4 Fitness, which helps to reduce the stress and intimidation often associated with health clubs (just bring your own towel). For those who simply need a quick change, we also provide private dressing rooms.